Frida and Diego’s wedding photograph, 1929. In her work of the early 1930s, Kahlo adopted the characteristic format of Mexican ex-voto paintings. Ex-votos are a Catholic tradition, an offering made as a gesture of thanks for salvation from illness or accident. Painted on small-scale metal panels, a material that Kahlo adopts in the works shown here, they depict both the incident and the saint to whom they are dedicated, along with an inscription describing what had occurred. However, rather than being tokens of gratitude, Kahlo’s ‘ex-votos’ are unflinching images of traumatic events drawn from her own experience, in which life and death coalesce. Kahlo began painting My Birth in 1932, following a miscarriage, and completed it after her mother’s death, a few months later. Thus, paradoxically, My Birth relates to two deaths. The child’s distinctive eyebrows mark her out as Kahlo, while the identity of the mother is shrouded beneath a sheet, and could represent Kahlo’s mother or the artist herself. Around the same time, Kahlo also painted HenryFord Hospital, 1932. The images of a foetus, a pelvic bone, a female abdomen, and an orchid that resembles a uterus are based on medical illustrations. The snail, she said, referred to the slowness of the miscarriage, while a sixth object, an autoclave, is an instrument used to sterilise medical utensils. The link to sterility probably relates to Kahlo’s sense of her own infertility. Rivera later commented that the paintings Kahlo made in 1932 were ‘much better than those she executed before losing her baby,’ describing her as: ‘The only artist in the history of art who tore open her chest and heart to reveal the biological truth of her feelings.’ Indeed, Kahlo told a friend that the painting A Few Small Nips 1935, based on newspaper accounts of a brutal murder, related to her feelings of being ‘murdered by life’. Sometime in the previous year, Rivera had embarked upon an affair with her younger sister Cristina, which wounded Kahlo deeply. 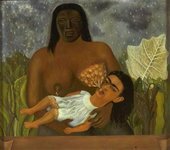 In My Nurse and I 1937, Kahlo paints herself as a baby with an adult’s head, suckling in an Indian wet-nurse’s arms. Her preoccupation with her mixed race genealogy takes an ambiguous tone in this work. The composition suggests a Christian Pieta, yet the threatening stone mask invokes darker aspects of Aztec beliefs. Protected and nourished by this ancient Indian bloodline the infant Kahlo is, simultaneously, offered up as sacrificial victim.